When I was recently at the bookstore I was drawn to the cover. Then I read the back and was intrigued. After opening the cover and realizing this was a graphic novel, I was totally sold! Let me start out by talking about the amazing artwork that told the story. From start to finish these black and whites are wonderfully detailed. I loved Larson’s ability to capture the character's emotions in her work. Mercury is the story of two teenage girls from the same family that just happen to live 150 years apart. Josey lives in the year 1859 with her parents on their farm. When a stranger shows up at Josey’s door to help her dad work their land she starts to fall for him. As I read I just wanted things to work out for Josey (especially after all the foreshadowing her not so normal mother has done). Josey Is so sweet and good, but not in that annoying way, you want things to work out for her. Tara lives in the present day world with her aunt and uncle while she is waiting on her mom to get a permanent job, since their old farm house recently burned. Tara’s aunt gives Tara all her mom's old jewelry to cheer her up about starting school. In the jewelry is one magical piece that will change things for Tara. I really liked Tara’s character! She did the best with what she was given and I loved her sense of adventure. I enjoyed going back and forth between Josey and Tara’s lives. It kept the book fresh and fast. I loved the ending! I will be looking into more from Hope Larson. 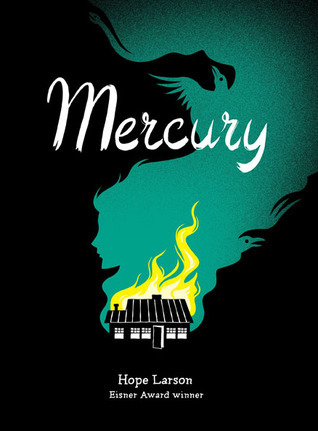 For anyone who has ever wanted to start reading graphic novels but just didn’t know where to start…Mercury would be great intro to graphic novels if you like YA. 12 and up: There is a kiss, and it got a little scary in places. I love the concept of the two girls living 150 years apart!! What an interesting plot, I think I'll have to look for this one. Wow, a graphic novel! For a manga addict such as myself, I must confess that I haven't read nearly enough of them! From the summary, I thought it'd be a novel, though. It sure sounds interesting! Specially since it sounds like the artwork was on par with the story this time. Well, I have been thinking I need to find a good graphic novel to read so that I can see what all the hype is about. Sounds like you found it for me. I will be checking this one out.